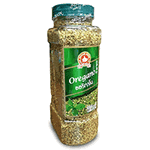 The warm, balsamic and aromatic flavor of oregano makes it the perfect addition to Mediterranean and Mexican cuisines. This popular herb whose name means "mountain joy" is available at the oriental Food and Gift Store! Product of Thailand.